There’s a wintry chill in the air in Paris, and nightfall comes early these days. It’s the time of year when comfort food makes a welcome appearance on the table. In this recipe, succulent fillet of pork is surrounded by autumn vegetables and slow-roasted in the oven. The aromas will tantalize your guests as they tuck into a first course, for example a spinach salad with roquefort or a plate of briny oysters with some lemon on the side. Speaking of oysters, this is definitely the season. I bought a dozen at the market on Sunday, wrapped them in a damp tea towel, and headed for my cottage in the country. The scene that evening: a roaring fire, a plate of freshly opened oysters on the table, and three people expectantly awaiting the feast. One of those people — me — was sporting a bandaid. Yes, I impaled myself while opening the oysters. It’s not my favorite sport, but I will do it if necessary (i.e. if no volunteers are around to help out). You need a strong sharp knife, or a special oyster knife, to get the shells open. I will post about this one of these days. But as I was struggling in the kitchen, with soul music pouring from the speakers in the other room, I have to say I started musing about how much easier it must have been to open oysters in another age — the Stone Age, to be precise. Whether you opt for oysters as a starter or not, you can follow this week’s roast pork with a cheese platter or just go straight to a seasonal dessert — for example, an apple tart or caramelized pears. It will make for a satisfying autumn meal, for family or friends. P.S. If you’re interested on following my progress as I research the deep ancestry of myself and my adopted daughter in hopes of finding our most recent common mother, you can visit my new Facebook page, Footprints Through Time. It tracks recent advances in human evolutionary genetics, and raises the personal issues I’m encountering as I go back in time to find the link between my East European Jewish ancestors and the lineage of my daughter, who was born in Mali of unknown parents. This entry was posted in 7. 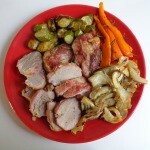 Meat Dishes and tagged carrots, finocchio, recipe, roast pork, zucchini. Bookmark the permalink.